If you love playing whack-a-mole, this recipe’s for you. But instead of bopping critters on the head, you’ll be smashing burger patties until they’re as flat as can be. 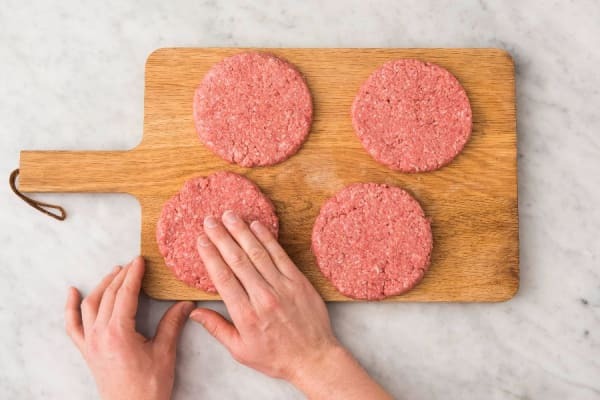 There’s a point to all that pounding, though (other than stress relief): the extra surface area means a patty that gets crisp and deeply browned for an incredible flavor sensation that’s sure to please even the most discerning burger lovers. Wash and dry all produce. Preheat toaster oven or oven to 400 degrees. 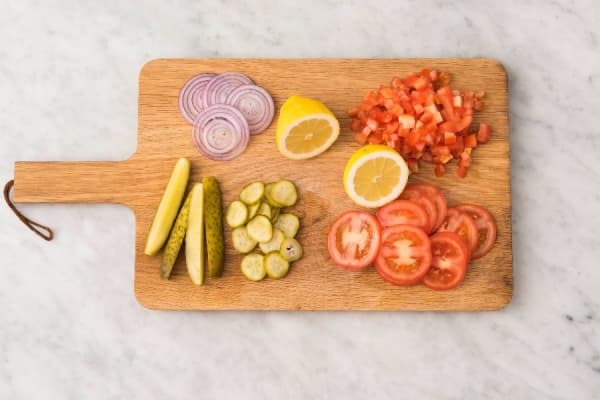 Slice one pickle into thin rounds; quarter other pickle lengthwise to create four spears. Cut one tomato into thin rounds; dice other tomato. Halve lemon. Peel onion, then slice four ¼-inch-thick rounds from the equator (the fattest part; use the rest as you like). Divide beef into four pieces, then shape each piece into a ball. Flatten each ball with your palm until you have a wide circle that’s about ⅓ inch thick. Season generously with salt and pepper. Heat a large drizzle of oil in a large pan over high heat. Add patties to pan and immediately press down with a spatula to flatten them as much as possible. Cook until deeply browned and crisp on bottom, about 3 minutes. 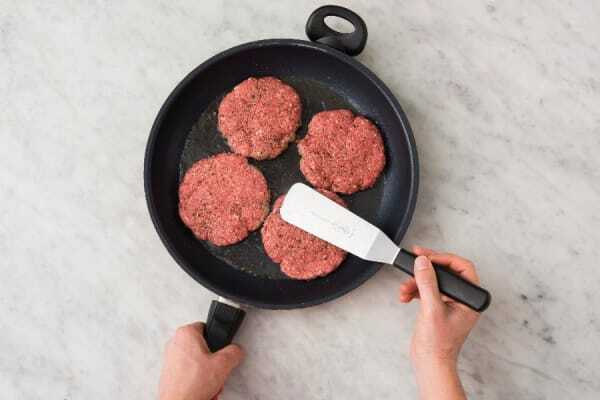 TIP: Press down with your spatula while the patties cook to increase surface contact, which will help them get nice and crispy. Flip patties over and cook on other side for about 2 minutes. 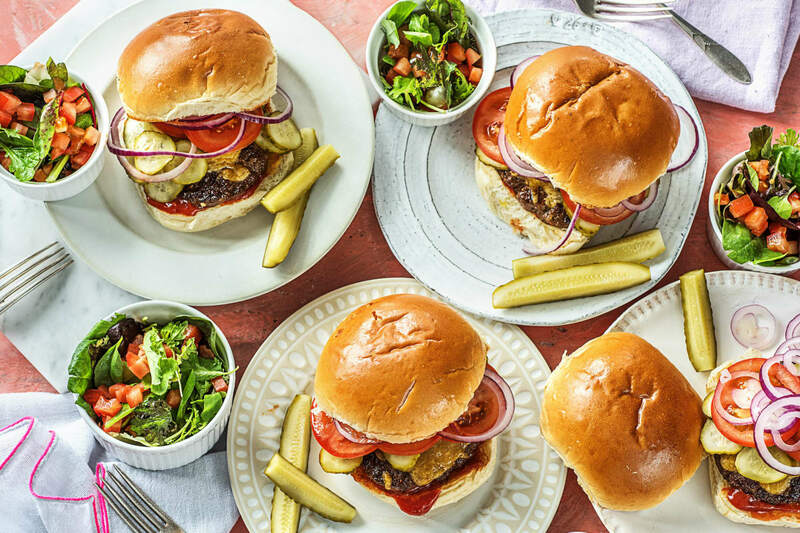 Sprinkle cheddar onto tops of patties, cover pan, and continue cooking until cheddar melts, about 1 minute more. 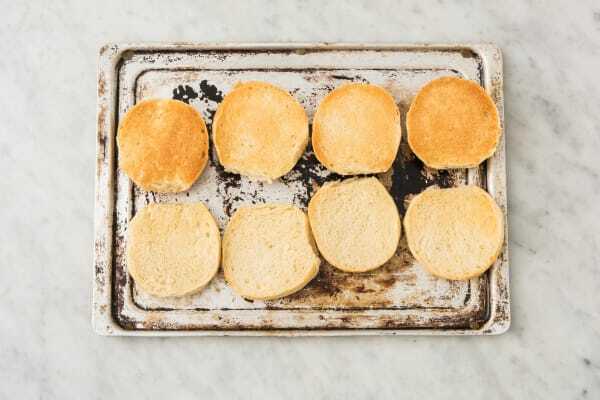 While patties cook, split buns in half and toast in toaster oven or oven until lightly golden, 1-2 minutes. (TIP: Place buns on a baking sheet first if using the oven.) Place lettuce, diced tomato, a squeeze or two of lemon, and 4 tsp olive oil in a medium bowl and toss to combine. Season with salt, pepper, and more lemon (to taste). Mix ketchup and a pinch or two of chipotle powder in a small bowl. (TIP: Set aside some plain ketchup for the kids—the chipotle is spicy.) 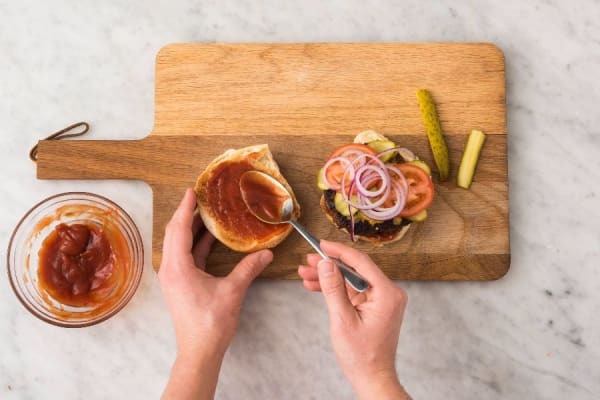 Spread ketchup mixture onto buns, then fill with patties, pickle rounds, tomato rounds, and onion slices. Serve with salad and pickle spears on the side.